Oakwood Industrial Park is located in Riverside County between the cities of Moreno Valley and Perris on the I-215 freeway at the interchange of the Cajaclo Expressway and Romona Expressway. Final Parcel Map in place. Excellent Interstate I-125 access and visibility. 840 ft + Street frontage on Cajalco Expressway. 1,040 ft + Street/Freeway frontage on Harvil Ave. Fully improved MSC zoned parcels, ready to build. Endless cross-marketing possibilities between services. 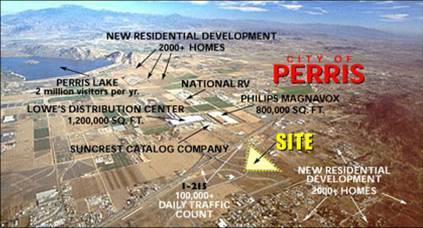 Located between the cities of Moreno Valley and Perris. Located in the master-planned Oakwood Industrial Park. Cajalco Expressway is a major corridor connecting I-215 & I-15. Cajalco Expressway used by 2,000,000+ campers per year visiting the Lake Perris State Park.